Sen. Susan Collins of Maine says the money will go toward repairing U.S. Route 136 in Durham. 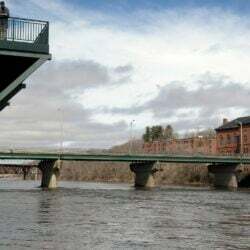 AUGUSTA — Sen. Susan Collins of Maine says the U.S. Department of Transportation is providing $500,000 in emergency funding to help repair U.S. Route 136 in Durham. Collins informed Maine DOT Commissioner David Bernhardt on Friday. The money will go toward reconstruction of the road, which was damaged by heavy rains last month. All told, Maine DOT says total damage across the state will top $2 million. Gov. Paul LePage issued an emergency proclamation on July 2 that identified area that were hardest hit by June’s heavy rains. That action started the process of requesting emergency relief funds.